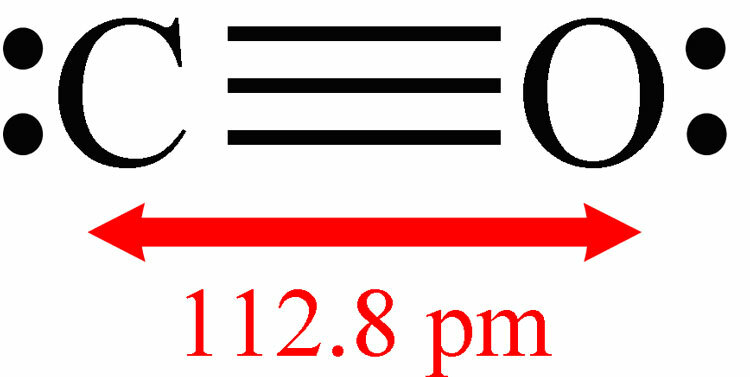 Figure 4.3: Carbon monoxide, a polar molecule. The polarity is due to the unequal sharing of the electronics in the triple bond between carbon (C) and oxygen (O). This results in a partial, or fractional, negative charge on the oxygen atom, and a partial positive charge on the carbon atom. One of the main reasons water will dissolve so many compounds is that the water molecule is polar. In chemistry, polarity refers to a separation of electric charge leading to a molecule having an electric dipole. 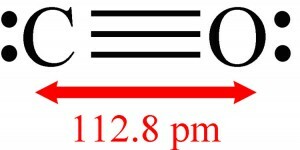 Consider a simple linear molecule like carbon monoxide (which can be quite toxic in enclosed areas, e.g. tents and garages), shown in Figure 4.3. Carbon monoxide is also polar. This occurs through unequal sharing of the electrons forming the carbon-oxygen triple bond. This results in a partial (or fractional) negative charge on the oxygen atom, and partial positive charge on the carbon atom. The partial positive and negative charges are illustrated in Figure 4.4. The yellow arrow represents the dipole moment of the molecule, or how the molecule would align in an electric field. Figure 4.4: An illustration of partial positive and negative charges, which create a dipole moment represented by the yellow arrow. The dipole moment indicates how the molecule would align in an electric field.